Think you know Schnittke’s music? Think again. This disc offers a range of new perspectives on his diverse output, some of which tally quite closely with his more famous compositions, while others sound like the music of a different hand, and possibly even a different era. The recordings presented here were masterminded by Alexander Ivashkin, Schnittke’s friend and biographer, who runs the Alfred Schnittke Archive at Goldsmiths College, University of London. Since Schnittke’s death in 1998, Ivashkin has done everything in his power to bring together scores of Schnittke’s lesser-known works and to present them to the world. 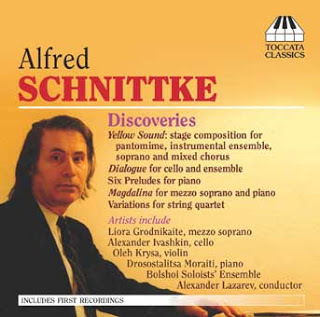 As well as the performances recorded here, he has instigated an “Alfred Schnittke Collected Works” Edition, a scholarly edition of Schnittke’s music, which is currently in preparation in St. Petersburg and which will eventually include all of Schnittke’s concert music, including both the more famous and the lesser-known works. At this point I should make a full disclosure about my own involvement. I took a Ph.D. in Schnittke’s music at Goldsmiths, where Ivashkin was my supervisor. I have also performed there with the pianist on this disc, Drosostalitsa Moraiti. I am currently a visiting research fellow at Goldsmiths. Oh, and I’m on the editorial team for the edition as well. Nevertheless, I didn’t know any of this music half as well as I should have, and as the title of the disc—Discoveries—suggests, there is plenty here that is obscure yet of great interest. The Piano Preludes that open the program are very early works, from 1953-1954, when Schnittke was in his late teens. The style is somewhere between Liszt and Rachmaninoff, a sumptuous romantic sound, pastiched almost to perfection by the rapidly rising composer. From a biographical point of view, these preludes pose some interesting questions. Are we to hear this music as Socialist Realism? Or merely as a series of stylistic studies? The invocation of Liszt seems against character. Schnittke would later describe Liszt as “the man who…brought Satanism into music,” so to hear obedient pastiche of the earlier composer’s style does seem strange. Moraiti gives a good reading of these works, and gets the Liszt/Rachmaninoff sensibility just right. She could be a little more dreamy in the Lento Third Prelude, but that is a minor quibble. The sound is reasonably good, but the mid range of the piano doesn’t sing as it might, suggesting minor tuning issues. Dialogue for Cello and Ensemble was written in 1967, a time when Schnittke was following the fashion for serialism, while gradually realizing that it wasn’t for him. That comes through clearly in this piece, in which the ensemble plays a pointillist serialism, while the solo cello line over the top is in a more lyrical and heartfelt vein. In later works, Schnittke would perfect that kind of stylistic plurality, but here it is still at the experimental stage. It is still a fascinating piece though, and Ivashkin (now as cellist rather than scholar) gives an emotive yet precise account. This recording was made in Canada, but an impressively Russian-sounding trumpeter has been found to give even the ensemble an appropriately Slavic edge. The most substantial work on the disc is Yellow Sound, better known by its German title, Der gelbe Klang. Everything about this work is bizarrely improbable. The libretto is by Wassily Kandinsky, of all people, who conceived it as a drama, dance, and music spectacle exploring issues of synesthesia following the example of Scriabin. Schnittke uses a Russian translation of the German words, but follows Kandinsky’s directions quite closely. The piece was written shortly after Schnittke’s seminal First Symphony, and that is the work that it is closest to in style….or rather styles. The whole thing is very Dada, with snippets from different styles, ranging from the baroque to jazz, appearing in short bursts out of silence. There is also some chanting voices and what sounds like electronic manipulation, which is all the more surprising given that it was written in Soviet Moscow in the mid 1970s and recorded there in the mid 1980s. The sound quality, ironically given the subject matter, is a little “gray,” lacking in upper partials and therefore instrumental color, but it’s not bad. This is a live recording of the first staged performance, and it is deeply frustrating not being able to see what is going on. Magdalina is a setting of a text by Boris Pasternak for mezzo and piano dating from 1977. The reason for its obscurity is that the composer withdrew it shortly before its first performance, saying that the music did not do the words justice. That’s a real shame because is a great piece. It dates from around the same time as Schnittke’s Piano Quintet, and like that work it seems to suppress a brutal anger beneath lyrical and, for the most part consonant, surface textures. The earlier sections also sound a lot like Górecki’s contemporaneous Third Symphony, with the muffled chiming of bells heard in the piano. But in the last few minutes the anger comes to the surface, leading to a violent and dissonant ending. The performance here, by mezzo Liora Grodnikaite and pianist Moraiti is excellent, although a bit more force from the piano might have helped in the last passage, which has volume of sound but lacks weight. The final piece on the disc, Variations for String Quartet, is one of the very last works Schnittke completed. It is typical of his very late style, in that the music is diatonic and even of tone, yet frustratingly inscrutable. The work opens in a meditative state, similar to some of the more devout utterances from Alexander Knaifel. But in the variations that follow, the music becomes even more simple, consisting almost entirely of major scales occasionally played in contrary motion. The performers here include Oleh Krysa and Alexander Ivashkin, both of whom worked closely with the composer, so I’m not inclined to take issue with their stylistic choices. The music is played very dry, with no vibrato or rubato, and also recorded to minimize reverberation. I’m sure there are other ways of playing this piece, ways that might offer the listener an easier way into the music. But these players just present it as it stands, and I for one, remain completely baffled. This album offers a range of fascinating music, and is a must-have for any Schnittke enthusiast. The program doesn’t hang together very well, partly because each piece is in a completely different style, and also because the recordings span more than 20 years and three different countries. Fortunately, though the chronological ordering helps to make sense of the package, and to link these obscure works to the periods of Schnittke’s creative life and to the more famous pieces that they occasionally resemble. This album won’t provide an easy way into Schnittke’s music for those unfamiliar with his work. Even for those who do know his more famous music, it poses more questions than it answers. Such is the nature of great art. This review appears in Fanfare Magazine issue 36:6.